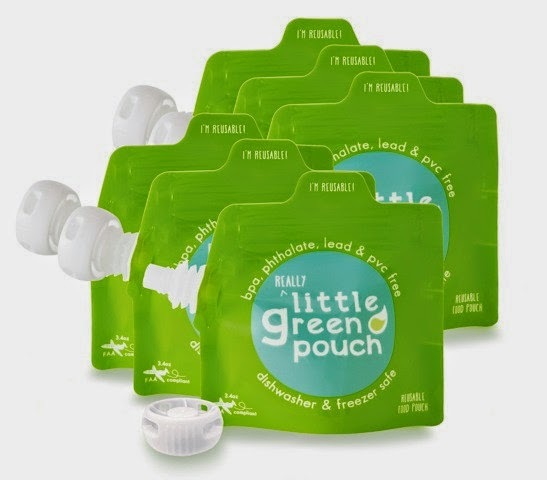 A while back, I shared with you about my experience with a new product, Little Green Pouch. One of the concerns that I had with those pouches was that they were a little bit bigger than felt right for the kids and I found myself filling them part-way. So, when I found out that they had a new product, appropriately named Really Little Green Pouch, I was excited to try them out. 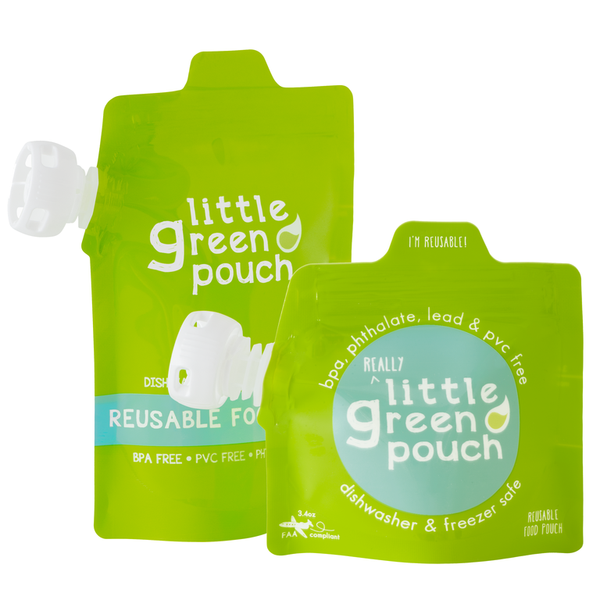 The Really Little Green Pouch is a convenient 3.4 oz size, compared to 7 oz for the original. The smaller pouch offers all of the same features as it's larger version. It is dishwasher and freezer safe. The pouch is marked with a line to show 2 oz fill, as well as the maximum fill at 3.4 oz. The pouch is reusable and has a spot on back for labeling the contents/owner of the pouch. They are easy to fill with a interlocking zipper bag closure (like on your sandwich bags). They are sold as a 6-pack and can be bought directly from Little Green Pouch or find them on Amazon. As with the larger pouches, we filled these with an assortment of things. I liked that not only could I choose what to put in them, but also that I had more control over the ingredients and texture (some of the pouch items that I have bought and tried were too smooth, I like a little texture to my nourishment). We used them for smoothies, which we are a big fan of at my house. It is not only a great way to use up the assorted fruit in the house, but you can even sneak in some veggies for more nutrition. I would also use it as a way to pack homemade applesauce (we have been enjoying cranberry apple sauce over the holidays - yum!) and treats like pudding. You can find a great collection of ideas/recipes on Little Green Pouch website. They are great for packing in lunches and also for packing in the bag on my bike when we head out for family bike rides. Since they are freezable, we could even use them as a small ice pack and ensure the contents were still cold at lunch time. What would you put in your Really Little Green Pouch? Courtesy of Little Green Pouch, I am able to giveaway to one A Busy Mom of Two a 6-pack of Really Little Green Pouch - 3.4 oz. Reusable Pouches. Giveaway will remain open through January 12th and is open to residents of the USA. Winners will be selected through Rafflecopter. The winner will have 24 hours to respond or a new winner will be selected. I bet my little guy would love some pureed pears or homemade applesauce in those little pouches! I was going to say applesauce but pudding is a really good idea. Smoothies that are partially frozen would be perfect for this- super healthy and NO mess! My teen wants these to fill with smoothies. So easy to grab and go before school. I'm experimenting with healthy smoothie puddings and this could be a great to-go container for this. I would fill them using the sweet potatoes and chickpeas recipe. I like the recipe for pumpkin applesauce. Applesauce and whatever fun recipes I find! I would use it for applesauce and yogurt treats for after school snacks. I would probably fill them with pudding or yogurt. I would fill them with pureed veggies for my baby boy. I would fill them with puréed veggies and fruits for my little girl . I would like to try their broccoli and pear puree recipe. I would fill mine with pumpkin applesauce. I would fill it with pear sauce. My little one can't get enough pears! If I won, I'd use these for applesauce. We would make homemade applesauce! My daughter loves bananas and yogurt so I would probably put that in the pouches! I would put applesauce or yogurt. Pureed bananas and strawberries, definitely! I'd love to make the broccoli and pear puree for my little one! I have the big Green Pouches, and I use mine for pureed soups, yogurt, and applesauce...they are so handy! I'd try several of the recipes on the website, starting with the Chicken, Sweet Potatoes and Kale recipe. My son loves Apple and carrot puree! im going to puree lots of different fruits and oats! yum!